Home » Phenomenon vs. Phenomena – What’s the Difference? Any time a star athlete performs well in his first season, sportswriters are quick to label the player a rookie phenomenon. Sometimes they might shorten it to phenom, but the meaning stays the same. What if there is more than one such player making headlines in a given season? Are these two players phenomenons, or phenomena? Even if there is only one, is he or she a phenomena or phenomenon? Given these words’ origins in ancient Greek, it’s unsurprising that some writers are confused by the difference. What is the Difference Between Phenomenon and Phenomena? In this post, I will compare phenomenon vs. phenomena. I will use each word in at least one example sentence, so you can see it in context. I will also show you how to use a mnemonic device to make choosing phenomenon or phenomena a little easier. What does phenomenon mean? Phenomenon is a singular noun. A phenomenon is something remarkable that happened, usually for unknown reasons or causes. Almost anything can be called a phenomenon as long as meets these criteria; unusual weather patterns, exceptionally talented athletes, and events in space. The airborne phenomenon was observed off the coast of Edinburgh at roughly 11pm last night. A seismic phenomenon caused the tectonic plates to shift and create a new lava flow to the surface. Phenomenon is sometimes shortened to phenom, as in the phrase the rookie phenom Cody Bellinger. Either way, it means the same thing. Phenomenon has roots in ancient Greek, where the original word meant to appear or to show. In philosophical contexts, a phenomenon is simply an observable fact or event, with no connotations of rarity or excitement. What does phenomena mean? Phenomena is the standard plural form of phenomenon. It means more than one unusual or remarkable occurrence, or in the context of philosophy, observable events. Celestial phenomena were often unexplainable until the invention of the telescope. Several phenomena transpired at once to bring us to the current state of affairs. What is the plural of phenomenon? The standard plural form of phenomenon is phenomena. Sometimes, however, writers mistakenly use phenomena as a singular noun and phenomenon as a plural noun. This is incorrect. Although deviations from this are incorrect, errors persists. To make matters even more confusing, phenomenons sometimes appears as a plural in the context of a talented individual. Michael Jordan and Kobe Bryant are two basketball phenomenons. In nonscientific writing, when referring to people, the plural phenomenons is accepted. 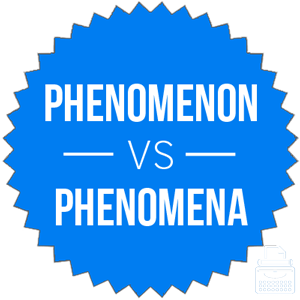 Despite occasional usage to the contrary, you should use phenomenon as a singular noun and phenomena as its plural. There are no situations where deviating from this strategy would make a piece of writing simpler or more easily understandable. Phenomenon is only ever a singular word. Phenomenons is accepted when referring to people. Phenomena vs. Phenomenon Check: Since phenomenon contains an extra N, like singular, you can always remember that phenomenon is a singular noun. It is phenomena or phenomenon? Phenomenon is a noun that means an observable fact or event in philosophy, and more commonly something remarkable or unusual outside the world of philosophy. Phenomenon is the only acceptable plural form. In certain instances, phenomenons can be used as a plural. 1 What is the Difference Between Phenomenon and Phenomena? Breech vs. Breach – What’s the Difference?